While libGDX’s 3d api has been a while brewing its not “officially” ready for prime time as such documentation is a little thin on the ground, however is still eminently usable. Its probably worth you reading this tutorial as well as its well written and unlike the gdx tests it doesn’t rely on multiple levels of abstraction and is all contained in the one class, so its much easier to learn from. Being high level once you work out how the API is intended to be used, its rather simple and just a small number of calls later you have a 3d scene up and running. I won’t spend much time on the 3d api as from the linked tutorial and the source (below) you should be able to easily follow whats going on – there really is no great drama here and I didn’t stumble on any particular gotchas. You have to be much more careful where it comes to bullet, its a very thin swig wrapper there are a few things to bare in mind. Return values – gdx bullet often reuses the same objects to return a value, for example if you get a vector from bullet, use this vector to set your own vector or strange things will happen ! I chose to separate out the main of the bullet code into a separate physics object class, in the main class we only deal with creating the physics world and creating our physics objects. 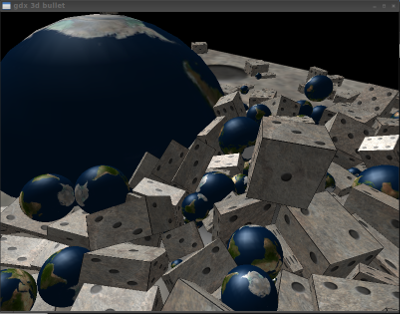 Physics objects can either be boxes (cubes) of different size along each axis (width, height and depth) or a balls of differing radius, Wavefront obj files are used to define the mesh templates for the ball and cube, the physObj class also needs a reference to the bullet physics world space so it can add objects into our simulation. As far as physics objects are concerned the difference between a sphere and box are fairly trivial, equally trivial would be to add another bullet primitive shape such as a capsule for example. However static (stationary) objects are a little more interesting. A motion state is not needed (in fact using one causes it to stop working!) one thing we do need to do is position the physics body as there is not a motion state to give the initial orientation and position. The shapes inertia also needs to be zero’d like the mass for a static body. Thanks for putting this up. Now that I have it running it would be easy to build on. Hey, thanks for this explanation, I try use the libgdx 3D and the physics simulation, but the information in the web is poor, I have experience with box2D, but I begginer in libgdx 3D and bullet physics. Again thank’s for the example, after copy de *.java and the assets, I run test perfectly.